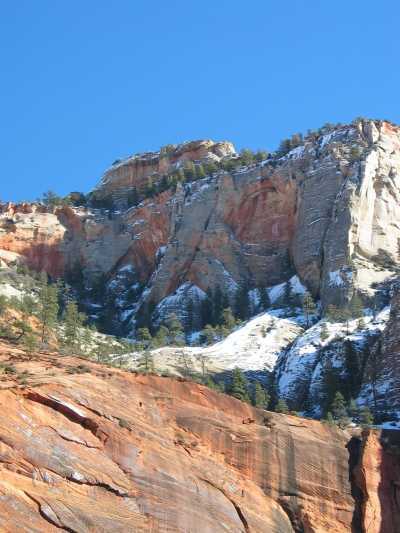 New Mexico Roadtrip day 2: Mon 28th Jan 2008 Zion N.P. After 12 h flight from Munich to San Francisco I had to wait another two hours for my connecting flight to Las Vegas and first surprise when fetching my Rental Car: My booked compact size car was out: I got an free upgrade to a 235 H.P. strong V6 motorized Hyunday Sonnata: A real rocket for me who is used to drive a 100 H.P. Audi A3. That was a great receiption. Very tired after nearly 30 hours without bed, I arrived in my first hotel, the Las Vegas Hilton. First bad surprise when taking my baggage out of the car I noticed that my rental car did not have any licence plates neither on front nor on rear. Got quite a little bit nervous because I already was ready to fall into bed (1.00 h am local time, 10.00 am in Munich next day). After Hotel check-in I made call to rental car agency and they tranquilized me: Thats normal for new cars, they have a temporary permit in the windshield. I dropped into bed. First day with happy end. Me and the Hyundai Sonnata V6. After a short uneasy night I woke up early about 7.00 am and couldn’t stay in bed any longer. My plan for this first day was not to drive to much and adapt to the time difference. Starting with a good breakfast in one of Las Vegas’s famous breakfast buffets couldnt’t be wrong. I have been there before, and the Bellaggio and Aladdin Hotel Buffets are my favourites and so I parked my car in the Bellagio Hotel and spontaneously decided to take the Aladdin Breakfast Buffet. Three cups of coffee, Orange juice, toasted Bagel with salmon and a great collection of fruit: melon, pineapple, cantalupe and ultra red and sweet strawberries (they must have been genetically engineered, so good looking). Being there on upper strip I took a walk through the desert passage of the Aladdin (an inside open-air shopping passage with oriental stylish), and also a walk into the Bellaggio Hotel to see the botanical gardens with its elaborate arrangements of plants and flowers in its bright, airy atrium, decorated with red lanterns to celebrate the Chinese New Year (and a very big and trashy barking dog puppet, representating the starting chinese year of the dog). The area with Aladdin, Bellaggio and the Bellaggio lake and the Paris Hotel Eifeltower and Ballon is my favourite location on the strip. So I enjoyed also a walk outside along the strip. Having been two time in Las Vegas before but never had time to check out the Hotel attractions I decided to go to South strip and have a look inside the Mandaly Bay, the Luxor and the Excalibur Hotels. I liked most the Luxor, with its inclinator elevators and its gigantic Atrium. Viewing from Excalibur Hotel towards MGM. Late afternoon my plan was to drive around a little bit in the side streets of the strip like Tropicana Avenue and Warm springs Avenue and doing some practical things like going to a supermarket (Albertsons) and filling my car trunk with diet coke and water bottles for the weeks stay. Going inside supermarket abroad is always an interesting experience for me, you see so many things you don’t have at your place. Finally I used this first day to indulge my passion of graphic novel collecting. I checked out two american Comic book shops which I have selected in Internet before starting my trip. And fortunately COSMIC COMICS at 3330 EAST TROPICANA was absolutely great and had a never seen collection of graphic novels. Very quick I had to stop shopping as I had reached the 100 USD limit I had set myself and the weight of the books had to be taken into consideration too. The rest of the evening I drove around visiting the Hard Rock Hotel and Casino and the Las Vegas Hofbräuhaus, having some quick eat and then heading back to Las Vegas Hilton and my bed hoping for a better second night. This Sunday morning I woke up with an incredible headache. I forgot to tell: The day before in the supermarket I also bought two bottles of a Wodka mix drink. My smart strategy was to use that alcohol in the evening to better fall asleep and quicker overcome the Jet Lag by a wonderful long sleep. Didn’t work out! With pain in my head I poured the second bottle into the sink, and swore to drink no alcohol anymore (for some time). Needing immediate aspirin cure I had to eat something and went down to the Las Vegas Hilton breakfast buffet. 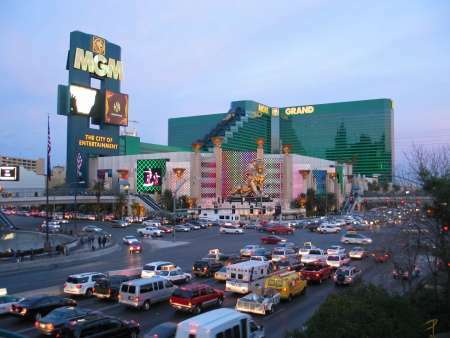 2 aspirins later, still headached I packed my luggage and checked-out: The next two nights I was booked for Flamingo Hotel on center strip. 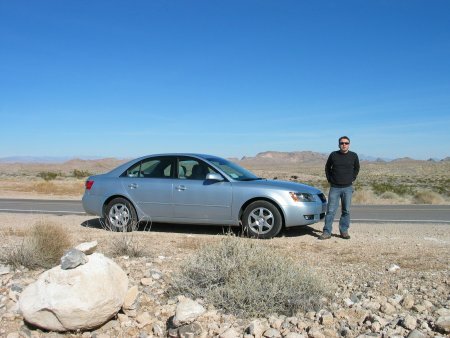 Day’s Plan for sunday was the first bigger tour with the car: North on I-15 to Valley of Fire State Park, and following the Northshore Road going south on Lake Mead to Hoover Dam. In total I drove about 160 miles on this day (256 km), a good start but nothing compared to what will come the following days. I enjoyed the Road tripping, stopped at a fuel station and checked out some beef jerky as a driving snack. 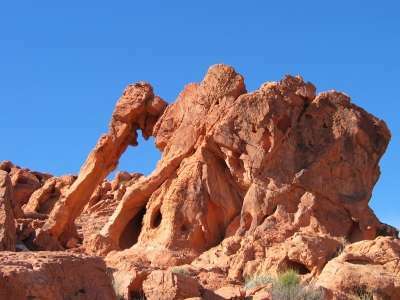 In Valley of fire I liked most the petroglyphs of Atlatl rock, the Arch rock and the Elephant rock. Elephant rock in Valley f Fire S.P. It was a long drive from VoF S.P. towards Hover dam along the Lake Mead. Returning after sunset in Las Vegas, and after a quick check-in at Flamingo Hotel: I made some night fotos of certain spots I always wanted to photograph: This is one thing I never could do when I was with Christiane on tour. She would have killed me for every photo stop longer then 2 seconds. Mostly I am proud of the Sahara, Hard Rock, Frontier and Welcome Las Vegas sign photos. Late the evening I went Downtown Las Vegas to see the Fremont street expereince. After that I was ready for my bed in the Flamingo Hotel: nice view from my room on 21th floor towards the strip and Caesar’s Palace. Hopefully this night gets longer. 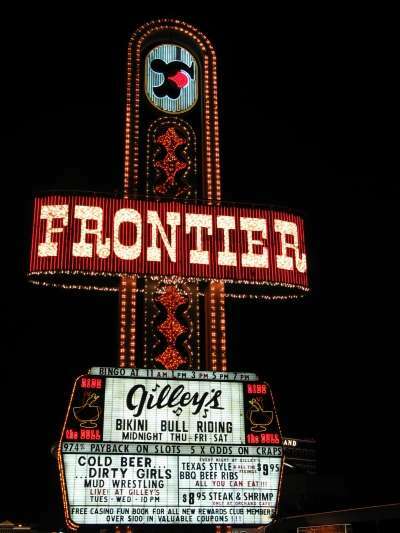 The Frontier Hotel sign on north strip. This morning I had set up a wake-up call for 6:30 am. No Headache and the first good sleep, although short. 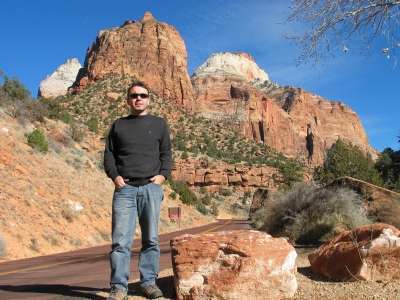 Today I had planned the first bigger trip to Zion Canyon N.P. in Utah, about 160 miles (256 km) north of Las Vegas. Mapquest had calculated me a 2h 30 min drive. Taking Flamingo road directly into I-15 North first surprise the morning rush hour and an accident and traffic jam, which cost me half an hour of stop-and-go. Exiting Las Vegas, traffic situation immediately improved and rising sun promised good weather. Its amazing leaving Las Vegas with all its lights, and finding yourself very quick in the desert with nothing around then rocks, sand and some Joshua trees. Mosquite was the next city after 1h driving and it looked very nice with golf camps, vacation appartements and lot og green around the Virgin river. Could imagine passing some night there. Next was St. George (Utah), where I left I-15 in north-east direction, taking a local road through Hurricane, Rockville I finally arrived at Springdale at 10 am. Springdale is the gate to Zion N.P. and there in a small Gift and Deli shop, I got a fantastic breakfast consisting of a hot ham-cheddar-bagel, coffee and some housemade choco-mint fudge. Entering Zion Park I bought the National park pass (50 USD) which allows one year access to every N.P. of the US, instead of paying the 20 USD vehicle fee. (I visited three parks in my 8 days so I saved 10 dollars, and who knows if I don’t return this year back to the states). We had visited Zion Park in Mai 2004, and so I knew what to see and where to go: Visiting Zion in winter has the advantage that you can drive along the whole canyon with your own car, whereas in the summer month you have to park at the entrance and use a local shuttle service.I drove along the Virgin river up to the Canyon end at Temple of Sinawawa, where I made a 1h hike the so called virgin river walk. Returning from there I considered two options: either making another 2 h Hike to the emarald pools along the middle trail or immediately taking the Zion Mount Carmel Highway and the tunnel to see the other side of the canyon which we liked also so much in 2004. I drove along the road and decided to drive instead of the hike. Driving down Zion valley aside the virgin river, I stopped several times to enjoy the amazing view of the snow sprinkled mountains of Zion and the river. It was about 2:00 pm when I had a spontaneous idea: Wouldn’t it be great to see also the Bryce Canyon snow covered? 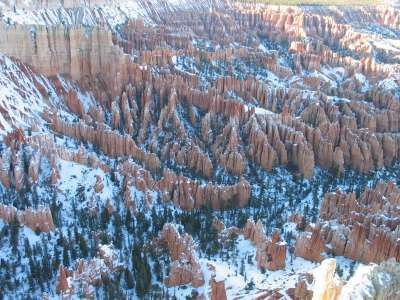 I knew from our last visit that Bryce canyon was about 1:30 h north from Zion. This meant I could make it before sunset. So jump in the car and drive another 1:30 hour further away from Las Vegas. I knew, that I had to drive this all back the same evening, but I didn’t care. I was on vacation and I had a comfortable 235 H.P. car. Driving higher and higher in the mountains was noticeable also by increasing amount of snow, but streets were ice-free and the sun was shining. Finally just before Sunset I arrived in the Bryce Canyon, asked in the visitor cnter for the best location to view the canyon in the evening light and was directed to Inspiration Point, 5 min. away from Park entrance. The view of Bryce with the snow was worth the drive. I enjoyed it for half an hour and then sat back into the car for the 250 miles (400 km) drive back to Las Vegas. It should take me about 4 hours, arriving in Las Vegas at 9 pm, having stopped only once for a Mc Donald combo of Spicy Crispy chicken and a Burger, with diet coke . Wow, today I made at least 500 miles (800km). The evening I left Flamingo on foot and visited the nearby attractions of Treasure Island (pirate ship battle), Mirage (volcano) and Bellagio (fountains). Very tired but happy I got to bed, knowing that I had to check-out the next morning at 6:00 am: My plan was to take a drive to Los Angeles making a deviation via Joshua tree N.P. Bryce Canyon late in the evening sun.